On Sunday, Soni Fink, a longtime board member of the Stuyvesant Town-Peter Cooper Village Tenants Association, died after a long illness. She had celebrated her 95th birthday a few days earlier on Wednesday, and when she died was home surrounded by family and friends. When active in the Tenants Association, from 2000-2017, 15 of those years as a board member, Fink was responsible for the organization’s communications to neighbors. This meant she frequently and quickly churned out emails and press releases about the various efforts being made to fight rent increases and quality of life problems in Stuy Town as well as rent gouging legislation in Albany. The work came naturally to Fink, who had a long career in journalism, working for a number of magazines as well as Women’s Wear Daily, where she was foundations editor. After time out for child-rearing, she worked in public relations for Macmillan, Inc., handling publicity for subsidiaries as G. Schirmer Music and Berlitz. She also continued to write as a freelancer, creating newsletters for Volkswagen of America and other clients. Jack Taylor, a historic preservationist and resident of East 18th Street in Gramercy, died last Thursday, February 7, in his sleep. He was 94, and had suffered some health problems, including with his leg in recent months, making it hard for him to get around. For decades Taylor was known for his efforts to save buildings slated for the wrecking ball in the Gramercy, Stuyvesant Square and Union Square neighborhoods and to get them landmarked. He was involved in numerous civic groups, including the Gramercy Park Block Association, the Union Square Community Coalition, the Stuyvesant Park Neighborhood Association and the Historic Districts Council. He’d been retired since the 1980s, when he served as managing editor for Family Circle for several years. After retiring, he still did some freelance editing work. His legacy of preservation began when he was inspired by the loss of Luchow’s restaurant, according to a transcript of a 2004 forum he participated in held by the New York Preservation Archive Project. The place was over a century old when Taylor learned it was at risk and got involved with an informal group aimed at saving it, headed by the USCC. The “born and bred” Manhattanite noted he had been born in Greenwich Village, not far from Luchow’s. Rosalee Isaly, the longtime president of the Stuyvesant Park Neighborhood Association, died at the age of 81 on July 24. Isaly, who’d been involved with the civic group for nearly as long as it’s been around, recently hosted a 50th anniversary gala for the SPNA at the historic church overlooking the park. However, less than a month after the event, she learned she had pancreatic cancer, and according to her son Jason, Isaly died 16 days later. She died while staying with family members in Chicago, where she was born and lived before moving to New York City’s Stuyvesant Square neighborhood. Her family held a funeral service for Isaly at the St. Barnabas Church in Chicago and she was buried in Interment Holy Sepulchre Cemetery. On Friday, March 30, the man known to many as “Gino the tailor,” Gino DiGirolamo, died at the age of 82. The owner of Royal Tailor, which was located in the East Village for 52 years, had suffered a heart attack a month ago that he never recovered from. His son Vito, 51, said his father, after having the heart attack on an L train platform, was taken to Beth Israel, where he stayed for ongoing treatment. He was visited regularly by friends and Vito, but the elder DiGirolamo never regained consciousness. In an interview with Town & Village three years ago, DiGirolamo, then working out of an East 14th Street shop across from Stuyvesant Town, spoke of his intention to retire after getting socked with a hefty rent increase. He’d been in that space for a few years, after moving from the original shop on Avenue A. However, his livelihood was later saved when he found a nearby affordable space on East 11th Street. As he had before, DiGirolamo worked long and hard, around 80 hours a week, commuting to the shop from his home in Ozone Park, Queens. On July 20, Herbert Rosenfield, a longtime Gramercy Park resident and community activist — also an original resident of Peter Cooper and World War II veteran — died at the age of 97. His passing, which came just 16 days away from his next birthday, was due to diabetes as well as kidney disease, which he was diagnosed with in June. His funeral was held last Monday. 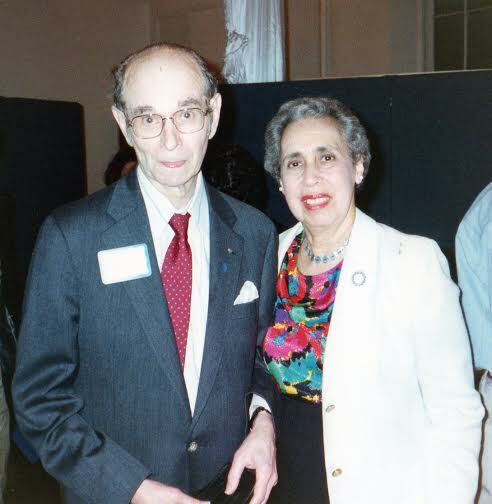 Rosenfield, who lived in Gramercy Park since 1950 (after a two-year stint in the newly opened Peter Cooper), was throughout his life involved in the community, focusing on quality of life issues through neighborhood organizations like the Block Association. His daughter, Patricia Rosenfield, told Town & Village that when her father and mother, Audrey Priest Rosenfield, moved into the community, “They were the youngest residents at the time.” Feeling there was a serious problem in the neighborhood of people not cleaning up after their dogs, Rosenfield, along with the rector of Calvary Church at that time organized the first community park cleanup event. Patricia also said Rosenfield was active in pushing for what would become the Pooper Scooper Law. Joseph LoMenzo, an original tenant of Stuyvesant Town and a longtime officer at the 13th Precinct, died in Fort Myers, Florida this past Tuesday. His death came on the heels of celebrating a huge milestone for LoMenzo: his 100th birthday. Just last month, Roger had accepted a plaque on his father’s behalf from officers at the 13th Precinct at the March Community Council meeting honoring this milestone. Of his father’s many years of service with the NYPD, most were spent at the 13th Precinct. Having lived through the last century, and in New York for more than half of his life, LoMenzo had a unique perspective on the city from that time. When he was growing up in the Bronx, he watched Lou Gehrig and Babe Ruth play ball in Yankee Stadium, witnessed the Hindenburg fly over the city prior to its explosion in New Jersey and spotted President Franklin Roosevelt in a casually sitting in a town car. LoMenzo, who originally joined the NYPD while living in the Bronx, served in the military during World War II and when he was discharged from the army in 1946, he rejoined the NYPD at the 13th precinct. He had heard that Stuyvesant Town was being built so he put an application in for an apartment, to move closer to the neighborhood than the Bronx. On March 3, Peter Cooper Village lost a World War II hero when longtime resident Jacob Friedman died. Friedman, who fought the Nazis with the partisans, groups of resistance fighters in Europe, died two weeks after collapsing from a stroke two weeks earlier. He had also been dealing with macular degeneration for several years. He was 95. According to his daughter, Sheryl Safran, Friedman, who was Jewish and born in Czechoslovakia in 1921, was able to avoid being rounded up by the Nazis during the early 1940s by joining the partisans. He ended up fighting his way through Europe, Safran said, evading capture until shortly before the end of the war, in 1944. He ended up in Mauthausen, a concentration camp in Austria, but got out when the camp was liberated along with other death camps. Then came a stint in a displacement camp for former concentration camp prisoners. Later, Friedman settled in Palestine, and after fighting in the Israeli War for Independence, remained in Israel. It was there when he’d meet the woman he would later marry, an American citizen named Bernice whose last name was also Friedman. William Koniuk, the founder of the The Frenchmen air conditioner shop on First Avenue, has died at 87. His son Glenn said Koniuk, who’d battled cancer his whole life, became very ill in the past couple of months and died on Saturday, July 25. He’d lived in Astoria, Queens, and until three years ago, worked 10-12 hours a day at his Manhattan store, which was well known for its annual Christmas storefront display. This was a tradition that continued for over 20 years. Koniuk also held Christmas parties every year for the neighborhood at the store, complete with horse-drawn hayrides around the block and live music. He and his employees would dress up as elves. But unlike most stores that use holiday events to try to get customers inside for sales, Koniuk knew not to bother. In fact, it was only because winter was so slow business-wise that he got the idea (and the time) to focus on putting together his Christmas display, which included dozens of moving Santa models and other holiday-themed characters. “After Christmas, I’ll think about selling,” he once said. We have lost another cornerstone of the Gramercy Park neighborhood, Dr. Phyllis Robinove Block, wife of the late rabbi, Dr. Irving J. Block, who was the founder of the Brotherhood Synagogue. Phyllis, as she liked to be called, the mother of Herbert Block and grandmother of Joseph, Isaac and Tamar, peacefully passed away in the early morning of Tuesday, January 13, 2015 at Mt. Sinai Beth Israel hospital. The contribution of this this scholar of French literature was significant to the culture of our city life – she was the rabbi’s chief volunteer in publishing a bulletin, year after year, compiling memorial books and, particularly, helping foster his mission of the brotherhood of religions. This was acknowledged by the presence of two mayors of NYC at the services, one in the sanctuary and the other at the first shiva – David Dinkins and Bill de Blasio, respectively. The funeral was January 14, 11 a.m., at the synagogue, with Rabbi Daniel Alder officiating, with Cantor Michael Weis, Rabbi Samuel Greenberg of Young Israel of White Plains and Rabbi Michael Miller of Jewish Community Relations Council offering readings. Son Herbert and grandson Joseph reminisced about their mother. The interment was at the Cedar Park Cemetery in Paramus, N.J.